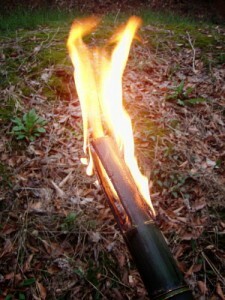 If you need a torch, one can be made using bamboo, fiber, and oil. I was recently asked to make a set of torches for a “crossing over” ceremony, where Cub Scouts who achieved the Webelo level, graduate and join a Boy Scout troop. Torches were traditionally used to carry the flame down to start the camp fire, initiating the ceremony. We had plenty of bamboo which we used earlier during wilderness survival classes so we had a wonderful resource for constructing a torch. By using a length of bamboo, all that was needed was to create a small reservoir for lamp oil with a support structure which acted as a wind screen. I started by cutting about 6 inches above a bamboo segment node. At 3 inches, I made 3 small cuts evenly spaced around the circumference, then I used a knife to split the bamboo from the end down to the cross cuts, creating in effect 3 fingers at the end. I placed some cotton fiber into the bottom of the segment reservoir and left about an inch above the cut. I then poured lamp oil onto the wick, saturating it well. The wick was then lit and the torch could be carried where needed. 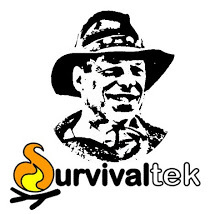 Unless a torch is made of metal, it will eventually be consumed unless it is extinguished. This torch is a visual delight and was quite practical for the event. Remember not to fill the reservoir too full, and lean the torch away from you and other flammable things. This entry was tagged Bamboo, DIY, Fire, Torch. Bookmark the permalink. One thing about bamboo that other readers may find useful to know is that it is extremely flammable. When a bamboo stalk catches on fire, it can build up pressure in the gasses that reside between each of the segments as the heat level increases. If it catches fire, once the pressure is too much for the bamboo hull, it will burst and create a loud popping noise. Just be prepared in the event that it takes place, you wouldn’t want to drop your torch while lit if caught off-guard.